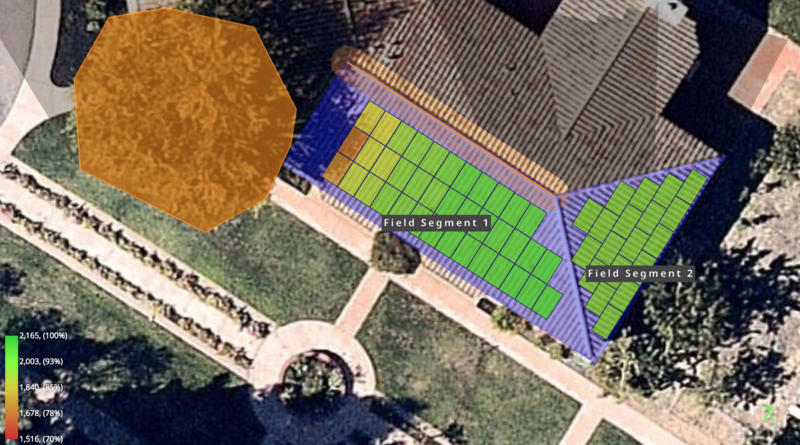 When you simulate a report you'll see a View Shade Report button that will automatically assess the Tilt and Orientation Factor (TOF), Solar Access %, and Total Solar Resource Factor (TSRF) for every module. This data is then summarized by field segment for easy reporting. Many rebate authorities already accept remote shade analysis instead of on-site measurements. This saves installers the hassle of getting on the roof for every project assessment - someone still needs to get on the roof to install the modules though! HelioScope's shade report has been accepted by authorities in California, Texas, New Jersey, Oregon, New York, Rhode Island and more. In addition, NREL has released validation of our shading assessment as a tool that is as accurate or more accurate than LIDAR sources. To see how to do this high quality shade modeling, we suggest taking a look at our article on Shade Based Height Estimation. If you would like to learn more about how we're adding coverage, please reach out to us at support@folsomlabs.com. Tilt and Orientation Factor (TOF): compares the available irradiance for the actual tilt and orientation of the array to the ideal tilt and orientation for that area. It is expressed as a percentage, so in the image above the first array receives 96% of the irradiance that an optimally oriented array would receive. Shaded Irradiance / POA Irradiance = Solar Access. To learn more about how the values above are calculated, view our Total Solar Resource Factor documentation.